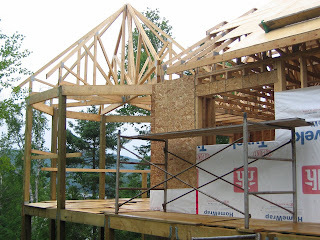 Cottage on the Edge - the DIY Cottage Blog: The Gazebo: The skeleton is in place! The Gazebo: The skeleton is in place! In previous posts I mentioned that we have completed the installation of the trusses for the gazebo. Here is the promised picture. 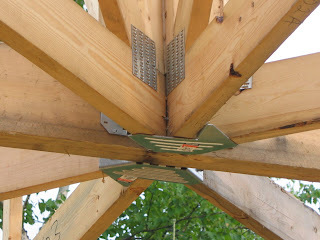 2 laminated trusses, these are supported on the nearest corner of the cottage and the far post. As I mentioned in the previous post, they are all attached in the center by a really nifty truss hanger. Here is a picture of the real thing. Here you can see the laminated truss (left to right) with three trusses in the foreground which are supported on their other end by the wall of the Cottage and three in the background which are supported on the other end to the posts. 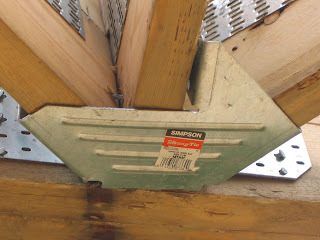 As I mentioned in the previous post there are two special truss hangers used to tie all eight of the trusses together, made by (you guessed it) Simpson-StrongTie.